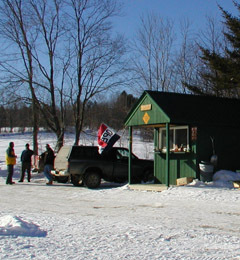 During the season, we operate the Cavendish Cook Shack on Saturdays and Sundays from 11:00 a.m. to 3:00 p.m. at the intersection of Route 126 C and Corridor 12 N/S (WR 43) adjacent to Twenty Mile Stream Road. Our patrons have voted us “home of the best cheeseburgers on the trails”. Our regular menu also includes hot dogs, hamburgers, chips, candy, coffee, hot chocolate, water, and soda. Also available for sale is Club clothing, baseball hats, and stickers, as well as VAST and Windsor County trail maps. 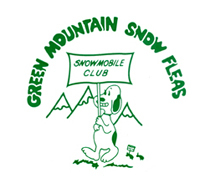 There is a heated outdoor seating area with picnic tables for relaxing and a Club sponsored Port-a-Potty. 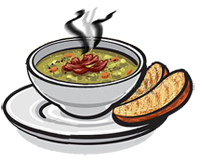 If you can spend a day helping in the Cook Shack or can donate a batch of your favorite soup, specialty sandwich or dessert to enhance our menu, please contact Jared Wilson (802-226-7494). Special menu items are posted on the home page of our website. 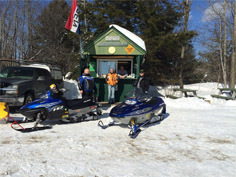 Profits from the Cook Shack are used to help defray trail maintenance costs.